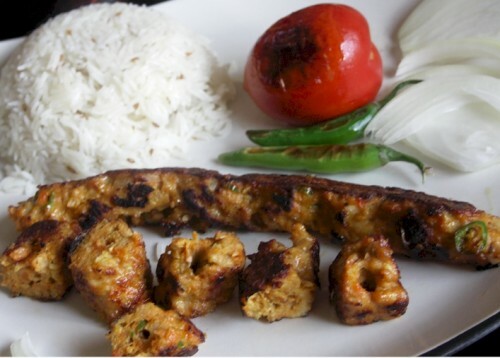 Kabab ( Also known as kebab, kabob) refers to meat dishes in the Middle East, Mediterranean, South and Central Asia, Africa, consisting of grilled meat on skewers or sticks. In America its more popularly known as Shish Kabob. 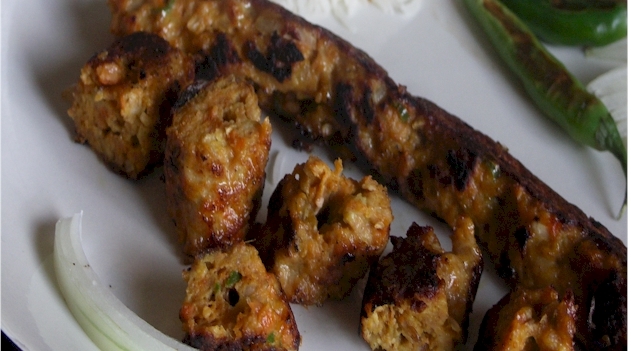 Sheekh Kabab is what it is called in India (Sheekh is the Iron Rod and Kabab is the Meat) and is usually cooked in the tandoor. The indirect heat from the tandoor cooks the meat very slowly while retaining all the moisture. This makes the kababs soft morsels of yum!! Ghee to brush the kabobs and cook in it. Mix all the ingredients above except the ghee and let it sit for for about 15 minutes. 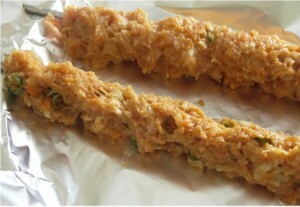 Take a handful of the mix, flatten it and roll it into sausages and insert the skewers through it. Brush them with ghee. You can either grill them on the outside grill. Or you can do it in the broiler (preheat the broiler to 375 and cook on foil till done but not blackened). I have done these on a skillet on the stove and it works just fine. Brush the skillet with ghee and place the skewers. Cover and cook for about 6-8 minutes and then uncover and cook at high heat. Turn around the skewers to cook on all the sides. Serve with grilled tomatoes and Jeera rice. I am a student, away from home, was in need some recipies to try on my own, that would taste like a resturant and yet be healthy ! I think I bumped on the right place. Sheekh kabob is my all time favorite and if I could make this at home, all of you can ! And it tasted no less ( if not better ) than the one I ate at the upscale Mughal resturant ! am related. I gonna soon become hero in my friend’s circle. Can I try this with other meats also?? any suggestions? Yes you can use any meat. Chicken and turkey are faster to cook. Red meat will take longer. Thats the only difference. I always wanted to try out cooking something different, thanks to ecurry…it has really boosted my spirits to cook n try new dishes, it would take time to learn these yummy recipes but i am sure it will turn out great….Thanks!! That sheekh kabab looks really tasty! Thanx for sharing this recipe. Ritu, Thanx and am glad that your husband liked it:-). I’ll try to write some chicken recipes as soon as I make them… you know the drill here. cook, take pictures, write and post:-) . Also will try to post something for kids as per your suggestion. thanx. I am sorry it did not turn out right. Traditionally they are cooked in tandoor. I have no tandoor, I do it on a skillet/tawa or on a foil under the broiler. If u do it on the skillet & cover and cook they will not get dry… if u get the ingredients right. Under a broiler try not to overcook, and in both ways brush them with oil or butter. Now in skewering them, make a big ball & roll it into a sausage, and run the skewer thru it. Do not make them very thick or the weight will make them fall .Hold the underside and place it on the foil or the skillet whatever u are using. that way they wont fall off. try to use smaller skewers or do it in sections. the bottom needs to rest on something if u are having difficulty skewering them. I have never tried using potato. Soma this is a good recipe, I have new set of skewers and I am certainly going to try this. 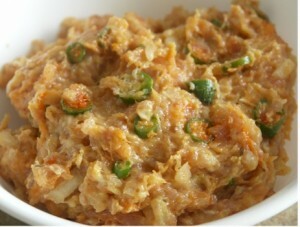 Soma, I tried this today for dinner, it was great and I am gonna impress my friends with this one. Thanks for sharing. When you say broil, do you mean the broil option in a conventional oven ? Will it get cooked when set to broil ? Also, what kind of skewers do you use ? I am gonna try this week… Will let u know how it turns out!! Iam from the beautiful Fiji Islands. I just came to this page after i googled as to how to make chaat masala. Its one of the coolest food pages i have ever been to. The way you describe each and every step of cookin and elobrate about food is just amazing. Iam looking forward to trying out some of your reeipes soon..
Uptil than good and and looking forward to seeing new recepies..